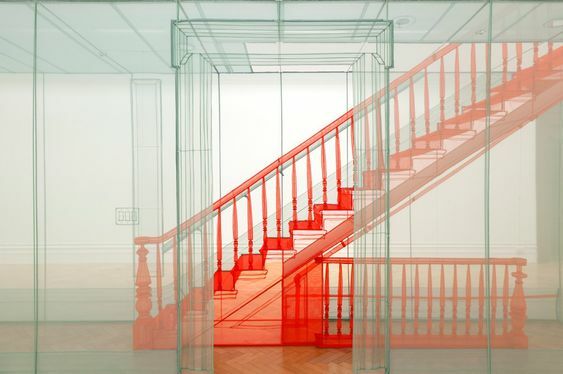 Do Ho Suh , Passage, polyester fabrics installations. Since I have moved to NYC in May 2018, I did a feature and a short and then I have mostly worked for the stage. I have a regular job at the Metropolitan Opera as a shopper now and I’m just finishing a play I have been working on at the Public Theater these past 5 weeks as an associate designer. I have left the theater world when I graduated from my Masters in 2013 because I felt like I didn’t fit in. I didn’t like spending hours in rehearsals, discussing concepts that I thought were unrelevant, having to force myself to belong to the group, working with people who believed theater would change the world although nothing on stage showed the diversity of our world and point of views. Instead I moved to LA to visit a guy (my husband now lol) and I discovered a new world by working on music videos and indie films there. When I came back to France I started to work on television shows and films and felt more at ease with the people in this industry. I felt like they didn’t try to be overtly intellectual and were just looking to do their jobs, make money and tell good stories. People just wanted me to be efficient and discreet and these characteristics suited me better than what my theater colleagues expected me to be. The surprising part is that theater and opera were the reasons I wanted to become a costume designer in the first place ! My mom used to bring me to the Opera House in Dijon to enjoy Offenbach music and I remembered being amazed by the costumes of The King Carrot. During all my students years, I have seen hundreds of plays, dance perfomances and operas. I was going to the theater at least once per week and kept a notebook with all the programs of the shows I have seen. I was hoping to be part of this world one day. I loved working on Sea Wall/A Life at the Public Theater this month. I enjoyed the simplicity of the process, the infinite time we had to try new things, fail, try again. I loved to watch how the costume became alive under the lights of the stage. I still have issues being seated for hours of rehearsals instead of running around and trying to find solutions to last minute problems like I’m used to in the film world, but I enjoyed having the time to be more sensitive and let ideas come and go. It’s a very different pace. I was able to be more focused on the body, the feeling of the space, the movement. Working with Kaye Voyce (the designer I was assisting) taught me that I could still express my love for details in theater, I have to trust my intuition more than ever and that I don’t have to be a people person to be part of this. This experience of coming back to theater is really disrupting me. I’m now more open to the idea that I could also fit in the theater world. I feel like as designers we are expected to pick a side film versus stage and it’s sad. I realized again that beyond the medium of the project I’m working on, the most important aspect of a work is the people I decide to work with. I can enjoy working on a film, on a play or on an opera as long as I feel comfortable and share the same vision with the people on board. I’m not exactly sure what this article is about and if it would be interesting to anyone… I felt like I wanted to talk about my experience of not being sure where I belong yet but acknowledging that I’m starting to understand that our work in this crazy industries are all about people. So rather than looking for my next project, I’m now going to start looking for the people I want to be around instead and see what happens next… thank you for reading.